Don’t even try telling me that the holiday season is not about food. Sure, it’s about family, giving, taking, being thankful and so on. But it’s also about eating, drinking and hopefully being merry before during and after. Food is a unifying thing. We may disagree about politics. We may disagree about religion. We may even disagree about – gasp! – platform shoes. But we all have to eat. Food also makes a good emergency gift for those unexpected last-minute party invitations, provided you know of the dietary restrictions of your potential recipients. Giving peanut brittle to someone allergic to peanuts is probably not a good idea. Just a guess. If interesting foods are not easily available in your area, search the net, place small orders here and there and keep a stash. And in this day and age when people are finally starting to give more thought where their foods come from and what goes into them (the foods that is), there is a variety of sources, where one could get guaranteed organically and sustainably grown products, either locally produced or shipped in via fair trade organizations. It’s a win-win situation because not only do the buyers get what’s good for them, but they also become contributors to local businesses and to farmers the world over who are trying to get on their feet. Two American-based companies: Bittersweet Herb Farm and Old World Specialties – have been my great favorites and gift sources for many years. In fact, long before organic became well and truly hip. Aside from their truly excellent and yummy products (one of Old World breads dipped in one of Bittersweet Herb sauces or oil-and-vinegar mixes – mmmmmm! ), they are the kind of companies who believe in attention to detail. They didn’t wait to get big. They didn’t wait till their products became available in stores the world over. They have always had great packaging, great recipes and great customer service. They have always participated in craft shows all around the country and offered free samples galore. And they still do. They’ve keep their selection small to make sure the quality doesn’t suffer. Something many food (and other) manufacturers need to take lessons in. I love Scottish Gourmet. I adore this seller passionately with all the ardor of a committed whisky salt addict. It is not as if whiskey salt is the only thing they have to offer. But it was my first love and so it shall remain. Seriously, folks, I am not suggesting you go and buy out their stock of langoustines or arrange a full game and meat spread with the appropriate preserves. (Although, if you do, I will be expecting a dinner invitation.) However, if you scroll through the site, you’ll see there are tons of fun little foods, condiments and seasonings that would make an awesome inexpensive food basket for a friend or a fabulous addition to your own pantry (spice drawer, over-the-stove cabinet, whatever…). For $5-$15 each, what’s not to love? 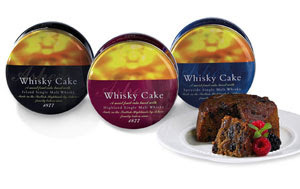 Whisky cake, anyone? Gentlemen, you may hiss and stomp your feet at me all you want, but it appears that women are more likely to come up with and bring to life health food initiatives. Why? Maybe because, traditionally, it was women who sought out edible berries, seeds and fruit and kept track of their growing cycle thus laying the foundations of modern farming. Or maybe because women got tired of waiting for men to get back from wars and crusades and started figuring out on their own how to feed their households and neighborhoods. One Mrs. Ebot Mitchell became an unwitting contributor against the battle against scurvy, when her handwritten book of recipes was found in 1707 in a house in Hasfield, Gloucestershire. The book contained a “Recipe for scurvy”, including plant extracts, mixed with orange juice and wine or beer. And little old village grannies in Russia saved many a wounded soldier during World War II by organizing mass cranberry pickings in the eastern swamps to provide a reliable remedy against scurvy and UTI, with antioxidants and proven heart health benefits. So, it came as little surprise to me that one of the best dry fruit suppliers in America started off in 1979 as a small family-owned company organized by working moms who frankly got sick and tired of feeding their kids store-bought crap with smell and flavor replaced by pesticides. (And here you thought it was the 21st century generation that invented organic.) Today Sweet Energy offers a delicious array of all things juicy, crispy, crunchy and – more importantly – really good for you. If you are nostalgic for mom’s cheese crisps or grandma’s home-baked chocolate-dipped pretzels, or just have a hankering for some decent fruit and berries in the middle of winter, this is the place. They are moms – they’ll take good care of you. Serrv is a new addition to the collection of places to get fabulous edible things from. This is not food-only seller. It is an organization promoting sustainability and fair trade around the world and helping farmers and artists in underdeveloped country jump-start their businesses, get paid good money and keep going strong. Food-wise, they have snacks, chocolate and coffee. As far as I’m concerned that covers the essentials. 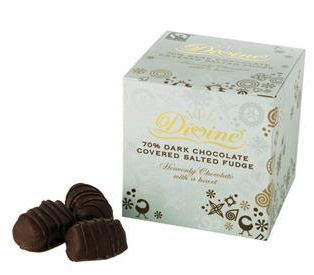 Seriously, folks, listen to this: dark chocolate raspberry medallions, dark chocolate hazelnut truffles, milk with spiced cookies, white chocolate strawberry, dark chocolate salted fudge. If that’s not poetry, I don’t know what is. The company that makes this delicious stuff is the first of its kind – the first farmer-owned cooperative in Ghana, supplying cocoa and chocolates at fair prices that the participants agree upon. If you are not into chocolate (which I’ll never understand but I’ll love you anyway), there are other things to choose from: fruit, nuts, rice, soup mixes and more. I am a huge fan of couscous and have been eyeing their traditional couscous offering from Palestine. …Although, those Eswatini jams and chutneys look REALLY good too. Let’s say, you don’t really want anything ready-made. But you’d like some ideas as to what to make. …And some entertainment for while you cook. Check out Sharon O’Connor’s Menus and Music. Sure, they offer actual food products – all very thoughtfully selected, like an all-natural honeycomb, Poco Dolce chocolate and Pommery Moutarde Royale (we have that – it’s to die for, it makes a hot dog feel like a royal feast). But the real treasure is in the gifts that keep on giving – namely, a library of recipes grouped by style and location and accompanied by music CD’s. The Bistro collection reveals the secrets of brie and allard, while creating the French street-side eatery atmosphere with the tunes by Edith Piaf and Gershwin. A Villa in Tuscany offers gnocchi, shrimp risotto and tiramisu to the strains of classic Italian opera. There is even a Home with Baby book/CD combination including recipes for home-made granola, fruit puree and teething biscuits accompanied by soothing lullabies. It’s a fun site to peruse both for gift ideas and for your own wish list. Eat well, drink good wine and enjoy the holidays regardless of your religious, political and national affiliation. Having a good time is an activity we can all get behind.